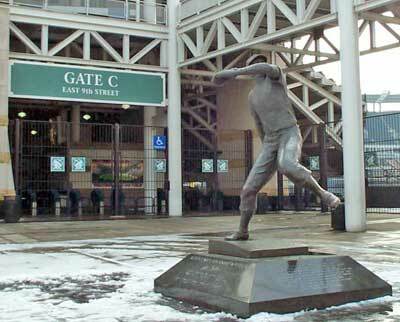 In any discussion of baseball greats, the name of Bob Feller will soon come up. The baseball accomplishments of "Rapid Robert" are legendary. He is arguably the greatest right-handed pitcher ever to play the game of baseball. 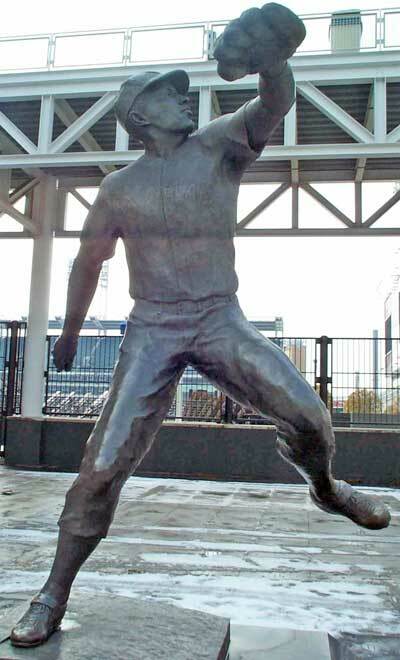 Visitors to Jacobs Field are drawn to the large statue of the high-kicking pitcher in mid-delivery. You can see some of his remarkable statistics (and photos) on page 2 of this profile. But there is more to Bob Feller than just the statistics. That's the Bob Feller we'd like to tell you about. 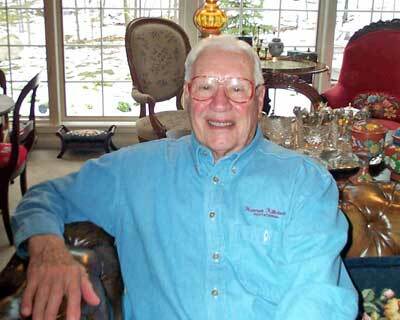 Born on November 3, 1918 in Van Meter, Iowa, Robert William Andrew Feller grew up on a farm. He worked hard - often taking the hogs to market to sell. "You can't learn to be a baseball pitcher in a gymnasium or pumping iron in a weight room. 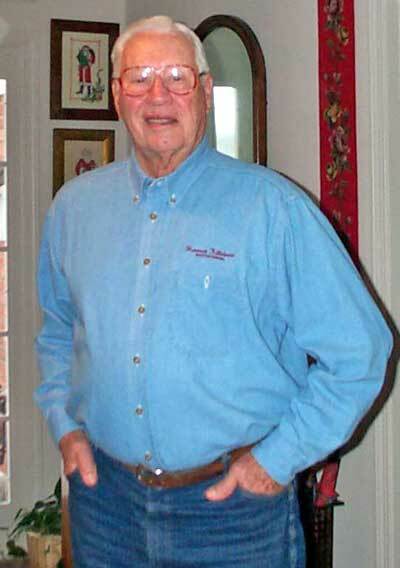 Try working on a farm in the fields, doing physical labor and hard work"
He learned a strong work ethic that carried him through his many years of baseball as well as his time in the Navy. At only sixteen years of age he signed with Cleveland and pitched three innings in an exhibition game. In those three innings he struck out eight members of the St. Louis Cardinals. It was clear that Bob Feller would become one of the all time great pitchers in baseball. As a rookie he broke the American League record for strikeouts by striking out fifteen batters in a single game. At age 22 he became the first American League pitcher to throw a complete game no-hitter on Opening Day. There was no stopping Bob Feller, his career was destined for stardom. But at the beginning of the peak of his career, Bob felt a duty to put aside baseball and go and defend his country. Two days after the Japanese attacked Pearl Harbor, he enlisted in the U.S. Navy and became an anti-aircraft gunner on the U.S.S. Alabama. When his four years were up, Bob Feller was more than just a fantastic ball-player - he had earned 8 Battle Stars and was a war hero. Leaving baseball at such a high point was a risky move, but not one Bob Feller had to think too much about. And he doesn't regret his decision or his time in the Navy. "Of course not. I love our country and I love the military." The big question on everybody's mind was whether four years away from the game would hurt Bob's pitching career. After all, those four years were prime baseball years and being away from the game could take its toll. The question didn't stay on anyone's mind long. In his first season back he won 26 games and 20 the next season. Bob Feller was back on top as if he had never left. He had six seasons where he won twenty or more games and each of these seasons he was the League leader. His record for the eighteen years he played with Cleveland was 266 wins and 162 losses. Bob Feller was not only a great player, but he was great for the game of baseball. An average of 10,000 fans more than normal would go to the ballpark whenever he was pitching. No other player ever had that kind of draw. He was elected into the Baseball Hall of fame in 1962 and is now one of six on their Board of Directors. Bob lives in the Cleveland area with Anne, his wife of 27 years. He has three sons from a previous marriage, 2 living in Florida and one in Hartford Connecticut. He also has a 12-year-old grandson in Hartford. Asked if he would want to see his grandson go into Major League Baseball Bob responds "If he has the talent - fine. If he doesn't fine. Just so he is happy." Amid the trophies and baseball memorabilia, Anne's beautiful embroidery work is displayed throughout their home, giving a warm welcome feeling. Cleveland has been a permanent home to Bob since 1948 when his father died in Iowa. He has stayed all of this time because his friends are here and friendship is very important to him. Anne and Bob enjoy traveling together and friendships ranks high among their treasures. "A person has a lot of acquaintances, but darn few friends". He constantly counts his blessings and considers himself lucky to have experienced good teachers, good doctors and good friends. "The people you depend on when things aren't going well". He doesn't hesitate for a second when asked what he is proud of. He does not answer in statistics, awards or baseball records. He is proud of his parents, his coaches and his peers. And he is proud to be an American. "Our ancestors who wrote the Constitution were very bright. There is no constitutionally guaranteed happiness, just the pursuit of it." He suggests that the very first lesson you should learn as you grow up is to make your own way and not count on someone else to do things for you, or blame someone else if things don't go well. "Life is not always fair. Be honest, get a good education, enjoy your life, but remember to touch all the bases." He is glad the baseball strike was averted, thinking it would have been a disaster to the game. He feels people are fed up with striking in general. The problem is "There are too many dishonest people and a handshake doesn't mean anything anymore". He credits people's greed and dishonesty for many of the world's problems. That and a lack of strong leadership from the family to schools to business to government. He cautions young people that "Character is like a shadow - it is always with you. Once you loose your good name, you will never regain it." He is not wishy-washy in his choice of words. He "tells it like it is" and expects consequences to his actions. Bob Feller is grateful to baseball for giving him a good living and giving him opportunities to travel and meet people throughout the world. He thinks the teams of today are missing the camaraderie he experienced when he was playing. This is partially due to the trades and free agency but also to the language barrier brought on by the high number of players from Caribbean countries. Players start to work as individuals not team members trying to increase their stats for salary negotiations. He loved traveling on the train - the upper deck of a Pullman. Teammates had the opportunity to replay the games in conversation and plan for the next game. The players really got to know and care about each other on and off the field. "It was a time when who won the game meant something and we planned for the next game"
A good friend of the late Mel Harder, Bob does not believe Mel will ever make the Hall of Fame. As a member of the Board of Directors he knows that every city has it's favorites and Mel Harder is one of Cleveland's own. Other cities would gladly give up his spot to one of their own and so it continues. Bob explains that in order to enter the Hall of Fame you must be able to go beyond local or regional "greatness". 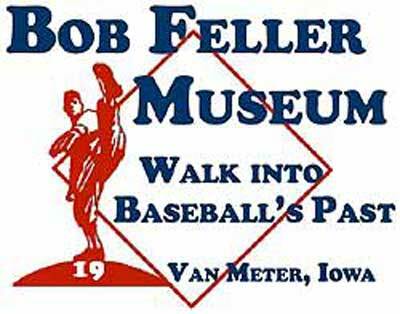 In 1995 the Bob Feller Museum was opened in his hometown of Van Meter. Bob has donated many of the articles in the museum and you never know when he might stop in to greet visitors. Bob Feller deserves to be remembered as so much more than a good pitcher. He should be remembered as a war hero - a man who walked away at the height of his career to serve his country. He should be remembered for his strong work ethic and for the way he loves his wife and family. He should be remembered as a man who understands consequences and lives his life accordingly. Maybe most important of all, he should be remembered as a man of character and a man of pride. Click on the Arrow in the middle of the screen to watch a brief video of Bob Feller cutting the ribbon to open Heritage Park at Jacob's Field. The Bob Feller Family thanks Indians fans for their warm wishes in the wake of Bob's recent passing. 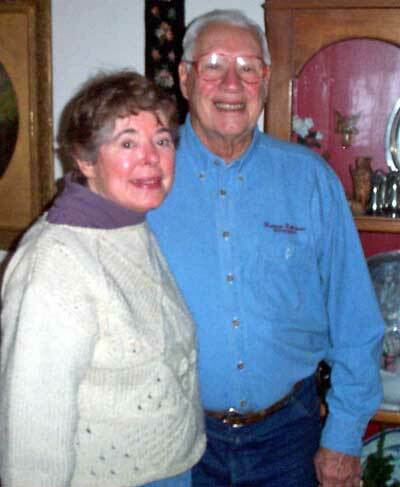 The Feller family would like to thank everyone for their warm wishes in the wake of Bob's passing. In addition to being a national baseball icon, Bob Feller was a husband, father, and grandfather. He will be remembered for his intelligence and charm, grit and seemingly limitless memory - and we all yearn to hear just one more of his larger than life tales. Baseball was his deepest love, and kept him remarkably active right to the end. As a father, he lovingly taught the game to his three sons. Most recently, he returned to the mound and threw his grandson batting practice at age ninety. Bob's family was larger than us though, extending to Cleveland and well beyond. He loved the city and its people. We know we are not alone in our sadness, and look forward to celebrating his illustrious life with you in the coming months. Lastly we would like to thank Cleveland Clinic and Hospice of the Western Reserve, for the care they afforded our entire family, and the members of the Cleveland media for respecting the family's privacy. Most importantly, we are indebted to the Cleveland Indians for supporting Bob and his family throughout the years. Copyright � 2002-2007 ClevelandSeniors.Com. All Rights Reserved.